Enter below for a chance to win 1 of 10 NBA Earned Edition Jerseys! Thank you for entering the NBA Earned Edition Jersey Sweepstakes. Winners will be contacted by February 13, 2019. 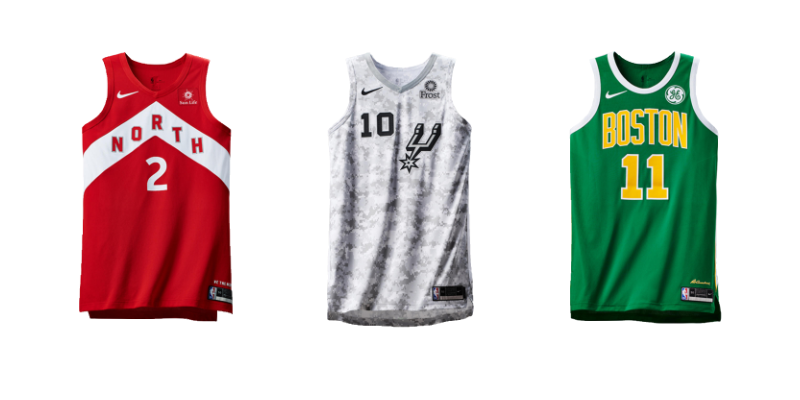 Each winner can select their favourite NBA Earned Edition Jersey, pending availability. *Contest is open to residents of Canada who are at least 13 years of age. “The NBA Family” means the National Basketball Association (“NBA”), the Women’s National Basketball Association (“WNBA”), the NBA Gatorade League (“G-League”), the NBA 2K League, their respective teams, and each of their respective affiliates (also referred to as “we,” “our” or “us”). To send you promotional messages and deliver advertisements about products, services, programs or events that may be of interest to you. These may be offered by, or on behalf of, the NBA Family, or by our partners and other third parties with whom we have a relationship. Among the NBA Family. We share personal data among the companies within the NBA Family for purposes consistent with this Policy. Communications choices. You can choose whether you wish to receive promotional messages from the NBA and which types of messages you wish to receive. If you receive promotional messages from us and would like to opt out, you may do so by following instructions within those messages. You may also adjust your communications preferences by logging into your NBA account and viewing your preferences. Please note that these preferences do not apply to informational or transactional communications regarding the Services or other communications that have their own unsubscribe method. You can access, edit or remove information in your user account by visiting https://secure.nba.com/membership/user/login/. If you cannot access your account, or if you would like to request that we delete other personal data referenced in this Policy, you may also contact us using any of the methods described in the “How to Contact Us” section of this Policy. The NBA Family takes security seriously. We take a number of steps to protect your data from unauthorized access, use or disclosure. These steps take into account the sensitivity of the data we collect and use, as well as the current state of technology. This includes, for example, storing your data on systems that have limited access and are maintained in controlled facilities. We also use, and require our vendors to use, industry standard security protocols when processing any payments for your use of the Services. NBA.com and other digital platforms. We have engaged Turner Digital Basketball Services, Inc. (“Turner”), including one or more of its affiliates, to operate the NBA.com website, mobile site and other digital platforms in the United States. The list of Turner affiliates that may receive access to your data includes Bleacher Report Inc., Cable News International, Inc., Cable News Network, Inc., Cartoon Interactive Group, Inc., Cartoon Network Enterprises, Inc., CNE Tours, Inc, CNN Interactive Group, Inc., Court TV Digital LLC, Courtroom Television Network LLC, Great Big Story LLC, Retro, Inc., Superstation, Inc., TBS Interactive Group, Inc., TCM Interactive Group, Inc., The Cartoon Network, Inc., TNT Interactive Group, Inc., TNT Originals, Inc., Turner Broadcasting Sales, Inc., Turner Classic Movies, Inc., Turner Digital Basketball Services, Inc., Turner Digital Entertainment, LLC, Turner Entertainment Networks, Inc., Turner Festivals, Inc., Turner Media Ventures, Inc., Turner Network Sales, Inc., Turner Network Television, Inc., Turner Pages, Inc., Turner Sports Interactive, Inc., Turner Sports, Inc., Warner Bros. Entertainment, Inc., Home Box Office, Inc., and Time Warner, Inc. Turner is a participant in the online self-regulatory program administered by the DAA and has agreed to adhere to the DAA’s principles applicable to interest-based advertisements. For more information about the DAA and other choices you have with respect to interest-based advertisements, please visit the “Cookies and Similar Technologies” section of this Policy. NBA Store. We have engaged Fanatics, Inc., including one or more of its affiliates (“Fanatics”), to operate the NBA Store at store.nba.com. To learn more about how Fanatics collects, uses, protects and discloses your personal data, please visit https://fanatics.custhelp.com/app/answers/detail/a_id/129/theme/standard. NBA Auctions/NBA Game Worn. We have engaged Commerce Dynamics, Inc. to operate the NBA auction site at auctions.nba.com (the “NBA Auctions Site”) and the NBA game worn site at nbagameworn.com (the “NBA Game Worn Site”). We have also engaged Meigray Group, LLC to sell merchandise through the NBA Auctions Site and the NBA Game Worn Site. NBA Photo Store. We have engaged Getty Images to operate the NBA photo store at photostore.nba.com. To learn more about how Getty Images collects, uses, protects and discloses your personal data, please visit https://www.gettyimages.com/company/privacy-policy. NBA Fantasy Games. We have engaged FanDuel, Inc. (“FanDuel”) and Yahoo! Sports (“Yahoo!”) to operate one or more fantasy games available at nba.com/fantasy. To learn more about how FanDuel collects, uses, protects and discloses your personal data, please visit https://www.fanduel.com/privacy. To learn more about how Yahoo! collects, uses, protects and discloses your personal data, please visit https://policies.yahoo.com/us/en/yahoo/privacy/products/sports/index.htm. NBA 2K League. We have partnered with Take-Two Interactive Software, Inc. (“Take-Two”) to operate the NBA 2K League, including the NBA 2K League site at 2kleague.nba.com. To learn more about how Take-Two collects, uses, protects and discloses your personal data, please visit https://www.take2games.com/privacy. The Services may also contain links to, or integrations with, other websites, platforms or services that are not operated or controlled by the NBA Family (each a “Third Party Site,” and collectively, the “Third Party Sites”). Please note that this Policy does not apply to those Third Party Sites. For more information on how those Third Party Sites collect, use and share data, we suggest that you contact the operators of those Third Party Sites directly. Although there are NBA fans of all ages, the Services are not directed at children under the age of 13, and our policy is to not knowingly collect personal data from children under the age of 13. We encourage parents and guardians to monitor their children’s online behavior, put parental control tools in place, and teach children not to provide their personal data through the Services without parental consent. For certain activities in which children are allowed to participate (e.g., Jr. NBA clinics), any request for personal data (such as registration data) is directed to the parent or legal guardian. Personal data collected by the NBA Family may be stored and processed in the region in which it is collected, in the United States, and in any other region where we maintain major operations. We maintain offices in Brazil, Canada, China, Hong Kong, India, Mexico, South Africa, Spain, Taiwan, the United Kingdom and the United States. We take steps to ensure that the data we collect under this Policy is stored and processed in accordance with this Policy regardless of where the data is located. By providing personal data in connection with the Services, you acknowledge and agree that such personal data may be transferred from your current location to the offices and servers of the NBA Family and our authorized third party service providers located in the United States. Our practice when transferring personal data is to rely on standard data protection contract clauses or individual consent. The right to request from NBA Properties, Inc. (“NBAP”), a “data controller” as defined under the GDPR, access to and rectification of your personal data. By calling us at +44-20-7420-8900. By calling us at (212) 407-8000.